Yesterday was another overcast windy day here at the beach. After doing some things around the house I thought I'd head to OC and make some boardwalk images, (I have this idea to do a bunch of HDR stuff on the boardwalk) but I didn't get any further than Fenwick Island. As I drove down the highway turning my head toward the sea, I kept looking at the beautiful dune crossings, so I pulled into a parking spot and headed to the beach. 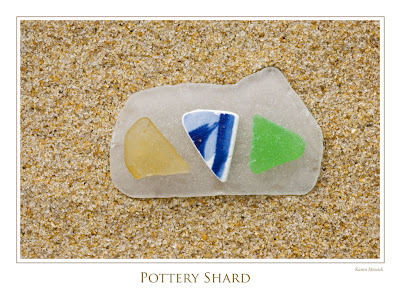 There were lots of stones on the tide line so I rambled along the shore picking up stones that interested me, stuffing them in my pockets, along the way, eventually to be added to my beach stone and pebble collection. 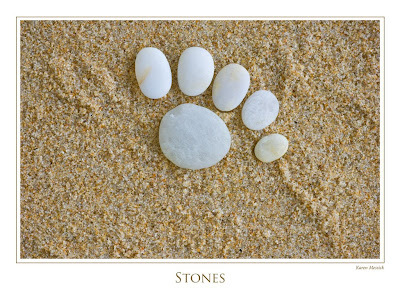 As I wandered I wondered what primal instinct is in us that makes us want to pick up stones? 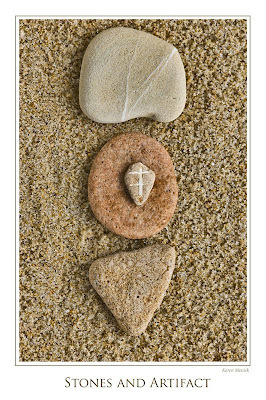 I know I am not the only one......we have had a relationship with stones since the beginning of time...Remember...the Stone Age...Stone Henge...Stone Arrows...all kinds of things stones have been used for over the years...but beach stones...I thought, are just a bunch or rocks like in bags at the store people use in their gardens...so why did they intrigue me so...mom even had a stone she called a worry stone...."With origins in Ancient Greece, worry stones are smooth, polished gemstones in the shape of an oval with a thumb-sized indentation. Held between the index finger and thumb, rubbing them is believed to lessen one's worries". 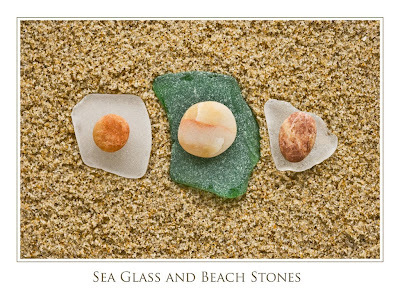 When I got home I opened up my Beach Stones book and admired the presentation of the images in that book. Josie Iselin the photographer used a scanner to make all the stone images in the book. 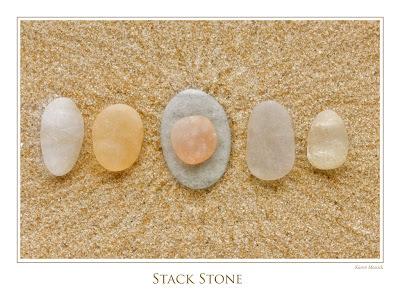 Gaining some inspiration there, I thought I am going to use the stones I gathered to make some images. Why did we bring them home? Ok thats it for beach for a few days~heading home tonight! 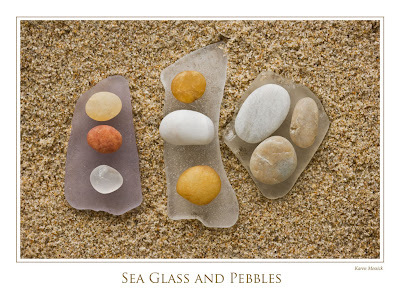 Very artistic way to use the beach stones and glass. My favorite is the white "foot" image but all are excellent and "fresh" images too.